This shape is most often used in Navajo concha belts and is called a butterfly. It's interspersed between the larger round or oval conchas on a belt. In this case, what would be the butterfly's wings are actually stamped to look like feathers, so we've called it a feather ring. But we thought we'd point out the traditional use of this shape and how it's most commonly used. 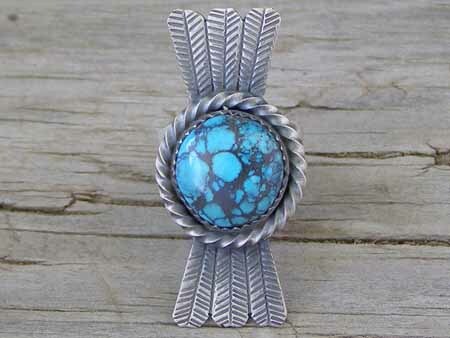 This is set with a stone of natural, untreated Chinese turquoise set in a serrated bezel and wrapped with twisted square wire. Melvin used steel wool to get a brushed finish on the silver before using an oxidizing agent to darken the Sterling and lend it an "old pawn" finish. Ring face: 1 1/2" x 11/16"